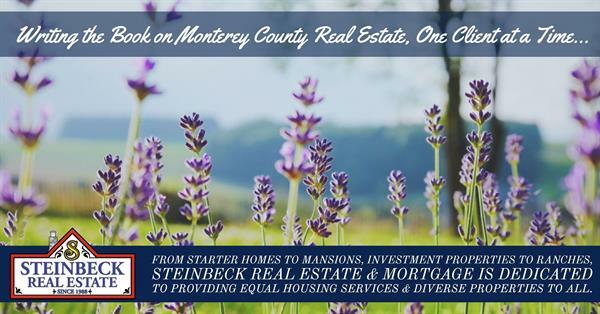 Steinbeck Real Estate is an independent, locally owned & operated real estate brokerage in Monterey County, CA. As Broker, Angela Savage has comprised her company of highly trained, ethical and top-producing Realtors representing buyers and sellers on the Central Coast and Inland Valley's of Central California. Through the years, Steinbeck Real Estate has grown to become one of the most productive real estate brokerages in Monterey County. Steinbeck Real Estate prides itself on superior client services, highly qualified agents and the many long lasting client relationships they have developed throughout Monterey County, CA. Located in The Heart of The Salinas Valley & Carmel-by-the-Sea, CA. Carmel-by-the-Sea: Su Vecino Court-Dolores Street Between 5th & 6th.